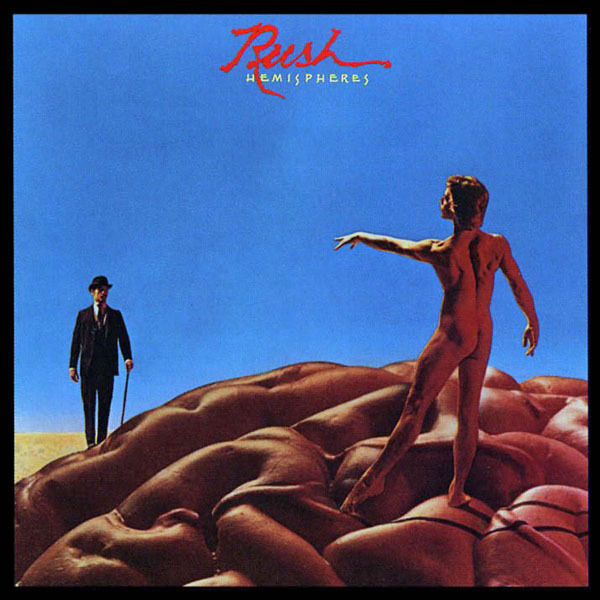 Fans will doubtless find Hemispheres another good, solid Rush album. And it's time to apprise the nonfans as well, because this power trio uniquely bridges the gap between heavy metal and sterile technology (sort of where Blue Oyster Cult used to work before going soft rock). The spine of Rush's sound is Alex Lifeson's broad, ringing guitar playing. Drummer Neil Peart is fluent at a large double kit, also adding colorations on various bells and blocks. Geddy Lee plays bass figures that fall just short of melodies, but his extremely high voice - either a triumphant cry or a grating yowl - is still a bone of contention. Though Lee can control his singing, he's often unnecessarily strident. The pick to click here is "Circumstances," whose chorus reworks the tidal stresses of "Something for Nothing" in sprung rhythm and whose lyrics are the most personable, least didactic on the record. "Hemispheres," the obligatory space opera, was meant to expand on "Cygnus X-1" from A Farewell to Kings, but the musical and thematic references are only tangential; on the new LP, the words belabor the bejesus out of the heart/mind dichotomy and skimp on the science fiction. "The Trees" is an attractively droll political fable with a gorgeously rendered classical-guitar intro (one of Lifeson's arcane strengths). But the real new ground is Rush's first stab at an instrumental: "La Villa Strangiato" boasts taut riffing, acute tempos, flawless phrasing, the discipline to sound effortless and enough energy to flow in torrents. Overall, especially in "La Villa Strangiato," Lifeson, Peart and Lee prove themselves masters of every power-trio convention. In fact, these guys have the chops and drive to break out of the largely artificial bounds of the format, and they constantly threaten to do so but never quite manage. If they don't succeed soon, complacency may set in. Already the lyrics are apporoaching a singsong regularity of meter, and the melodies are beginning to lean too heavily on mere chording. I affirm this band's ability to rock out, but I really want to give Rush a hard shove in the direction it's already heading.